Our agile power pack from the Comfort line, with a cutting width of 93 cm, is perfect for efficiently and quickly mowing large gardens. The T16-93.7 HD V2 Comfort lawn tractor is powered by a 9.6 kW twin-cylinder Briggs & Stratton engine. The cutting height can be adjusted centrally from 20 mm to 80 mm in 6 stages. 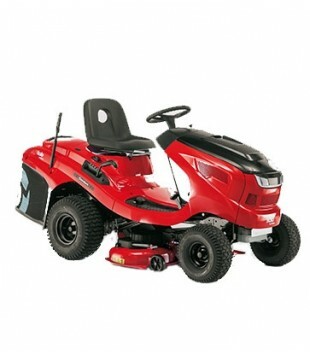 The durable, ball-bearing-mounted mower deck made of sheet steel includes two blades for a clean cut of the grass and is designed to be easy to remove for cleaning or maintenance. 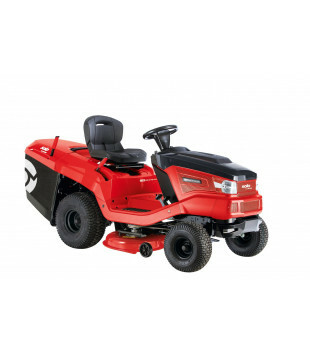 The large 18 inch tyres ensure optimum traction whilst being gentle on the lawn. 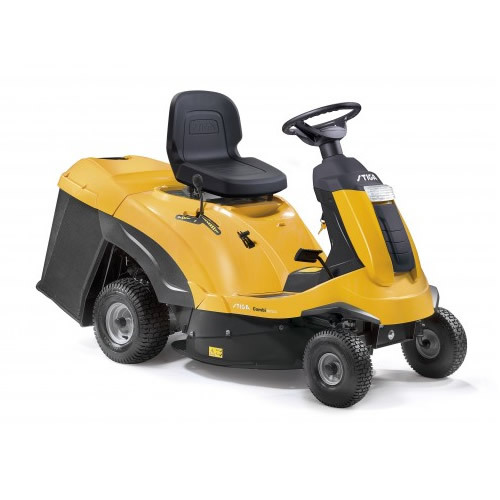 Whilst sat in the adjustable driver’s seat, the large 220 l collector can be emptied simply by using a telescopic lever. The audible fill level signal alerts the user that the collector is full and requires emptying before any blockages occur. Another comfort advantage is the soft touch anti-slip steering wheel, the headlights with bright LED lights and the clear controls.